Sharm El Sheikh boasts the widest array of fun, exciting and even crazy water and extreme sports: besides diving, snorkeling, sailing, wind and kite-surfing, you can even try sky diving or parachuting from a helicopter on your next holiday in Sharm El Sheikh. Moreover, from Sharm El Sheikh, you can easily book trips and safaris into the nearby Sinai desert and discover the amazing St Catherine Monastery, or the majestic Sinai Mountains. You can also head to Sharm for a wellness and pampering holiday; the town is home to Egypt is most famous and professional Spas in Egypt. Add to that endless nights spent at local bars, nightclubs and beaches dancing the night away or the magic of an existing safari into the mountainous Sinai desert landscape and you will know why Sharm is ranked among the best vacation destinations in the world. Sharm El Sheikh has it all to make your holiday an unforgettable experience. 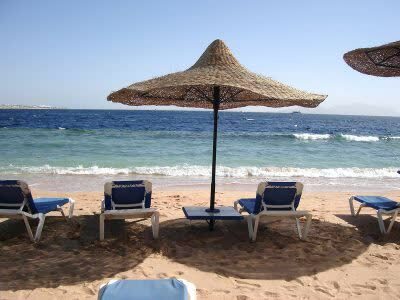 Sharm El Sheikh is located on the Gulf of Aqaba, about 300 km from Suez and 19 km from Ras Mohammed National Park. Inside Sharm, Naama Bay is where the action is to be found whereas the Old Town is where you should head for your daily shopping and souvenirs. If you are in the market for some serenity Hadaba (near Ras Um Sid) would be your choice, here you find calm hotels and resorts. To explore the Ras Mohammed National Park and Nabq Protectorate, or to go on diving and snorkelling trips head down to the marina or to one of the town docking ports.